Warning! Singapore gangs are selling fake flash memory on eBay. They are well organized and coordinated. If you see a buyer in Singapore purchasing an item from a seller in Singapore, it is to manipulate the sellers feedback score. The feedback they leave, is most of the time, within minutes of purchase. “feedback left for others” also links them to all of the sellers in Singapore. 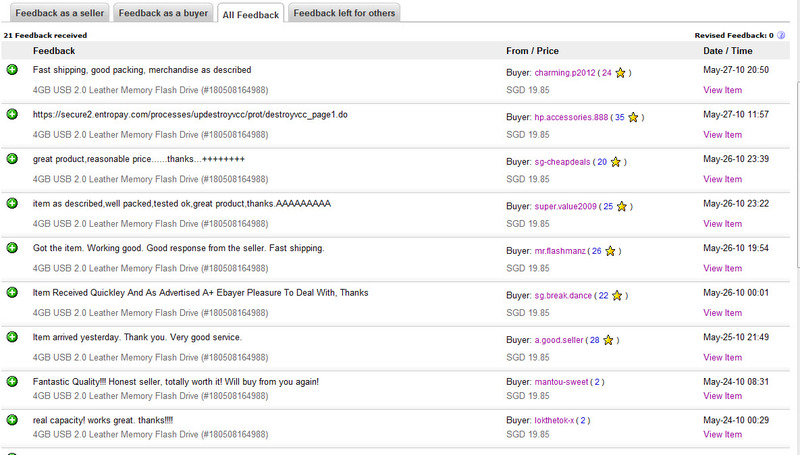 Check the very first feedback they leave, it will always be some buyer or seller in Singapore,. They also, leave fake feedback messages: “real capacity”, “fast delivery” “made in Japan “or “passes H2testw”. This is a special report from FakeMemorySentinel’s Spookie, investigator and lead detective in Dragon Dakel’s team. Read just how well organized this ring is, how little eBay does about it. Spookie reveals how fake flash memory crime rings are set up on eBay. After reading his report, you will be able to spot who the next Singapore eBay fake flash memory sellers will be! – TechReporters . Here is how it works. First, they set up an account on eBay, then activate it at a later date. They use these accounts to purchase or sell items, usually cheap items like jewelry, small capacity flash memory drives usb and sd cards or cell phone accessories, to build up the positive feedback. They later switch to larger capacity flash memory items 16, 32, 64, 128 and 256gb. They either sell you a fake capacity usb or sd card or fail to delivery the item all together. Setting up accounts. (Note: use toolhaus.org it will take you directly to any of these sellers and it will also give you all of the negatives and neutrals). Take hp.accessories.888, for example. He buys only 2 & 4 usb drives from Singapore sellers. I like to refer to him as a primer, he sends out positive feed back to drive up other Singapore sellers feedback scores. Take look at his feedback page, he has a score of 37 right now and is rated at 100% , looks normal. Check the feedback for hp.accessories.888 as a buyer from checkpoint.23, japan.quality, beancurb-88, lets.rock.now, gift.4u, sgbest.2122, supzer.price90 , my-mobile999 and value.store.555. “Thank you for an easy, pleasant transaction. Excellent buyer. A++++++”. Feedback left for others. Let’s go back and look at hp.accessories.888 “feedback left for others”. He left over 194 feedbacks, with a score of 35, what happened to 159 feedbacks from sellers? Almost all buyers and sellers leave feedback. What happen? They got lazy and didn’t think anyone would noticed. Another thing to look at under “feedback left for others” is the large numbers of sellers that are no longer registered, all are in Singapore. Lets look at the feedback hp.accessories.888 left spicy.bar6 item # 180515496145, notice the feedback date and time, Jun-06-10 at 21:36. The sale was on Jun-06-10 at 21:33:58 PDT, the feedback was sent less than 3 minutes after the item was sold! Same thing with united-color100 item # 27058733508 the sale was on Jun-06-10 at 21:33:53 PDT feedback was left on Jun-06-10 at 21:36 less than 3 minutes later. All of the feedback is sent out has the actual date time with the same message. These transactions are nothing but feedback manipulation. Here is another example of feedback manipulation: checkpoint.23, item # 180508164988. Go to the item and click on view, next click on 9 sold, that will give you the purchase history, now you can see the purchase history and can compare it to “feedback for as seller”. Just match up the feedback scores on both list. All of the items sold are 4GB USB 2.0 Flash Drives. Look at some the feedback they are all fake. One says, it was tested another got it yesterday. Where is eBay?Even if you report a violation eBay doesn’t do anything. If they do take action it is usually just the seller, but all of the buyers are violating the same feedback policy and should suspended. I guess you can look at it this way: eBay makes money off the fake sales or they are to busy. What ever they are doing, they are letting their customers down and the crooks take you money. ← Kingston DataTraveler 310 DT310/256GB Fake USB Flash Drives Flooding eBay! Fraud Warning. The following are a part of the Singapore gang and are currently selling sd card and usb flash drives, some of these have negative feedback, do not buy from them: tiger.plane, nice_flowerzz, major-flash, vert.cd, pillxs, horrors.2010, body.workout, redislah2, h20water, blue.ozz, magarardo, fix.my, cheapos2010, kiwifruitx. The Singapore gang has created over 400 id’s in the 4 months and can be linked by the manipulated feedback that the leave. The following Singapore id’s are manipulating feedback by sending out fake positives. a hacked flash item from any of these guys, please report them to SOSFakeFlash.wordpress.com. The Singapore gang is no longer manipulating their feedback. Do not buy anything with flash memory from them! with H2testw and report and fakes to SOSFakeFlash. wordpress. had a score of 13, shrekmovie had a score of 13, sonbenton had a score of 15.
do not buy from them!!!! the feedback scores of that seller. Do not buy flash drive from any of them, they either sell you fake or send you nothing. It it says made in Japan and sold by a seller from Singapore do not buy, they are fakes. The Singapore gang is vary actively selling 128, 64 and 32gb drives at this time. Update on the Singapore gang. The Singapore gang are hiding their tracksby going private. The following Singapore sellers: merryme*121 is selling 128gb usb flash drives, ctrl_alt_del7880 is selling 16 and 32gb flash drives, survived.the.ordeal is selling 16gb flash drives, usddollarstore2010 has been selling 64 128gb flash drives. These Singapore sellers are not sending any drives or sellomg fakes : bbaby-king has 1 negative, checkpoint.23 has one fake reported, japan.quality fake capacity drives reported, new.age.geekress multiple fakes reported, noodles.8822 fakes reported, snowman_688 multiple fakes, goodbargain.2010, happy.eb4yer, hot.dog228, long.island999, memory.king2010 pandaflash-x, pigleg_21 are taking money but sending nothing. Remeber this if is a private auction they are hiding something and it isn’t something good> good.